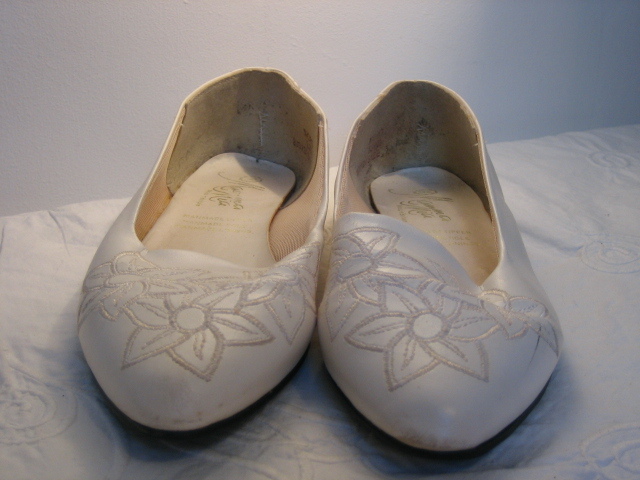 Vintage flat white patterned shoes. I intended listing these shoes under 'other things' as I have no idea how old they are: in fact, I know very little about them at all! They were bought as part of a job-lot of American pieces from the 50s (along with, for example, a delightful red Boy Scout's jacket listed under 'others' until I get some more jackets together! 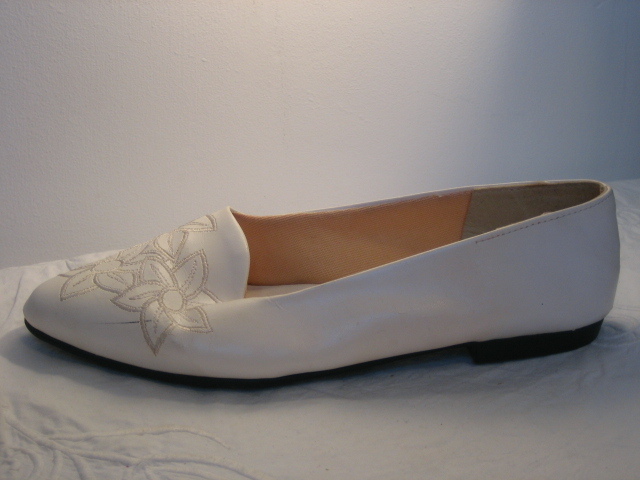 ), most of which were in perfect or near-perfect condition and provenance as stated...but I have no idea about these shoes! 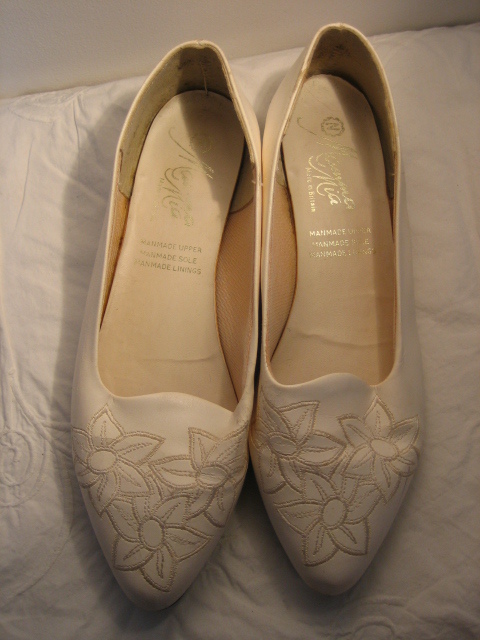 They are a pretty pair of flats, man-made materials, in excellent condition, with flowers embroidered on the toes. Inside is printed, 'Mamma Mia Made in Endland'. 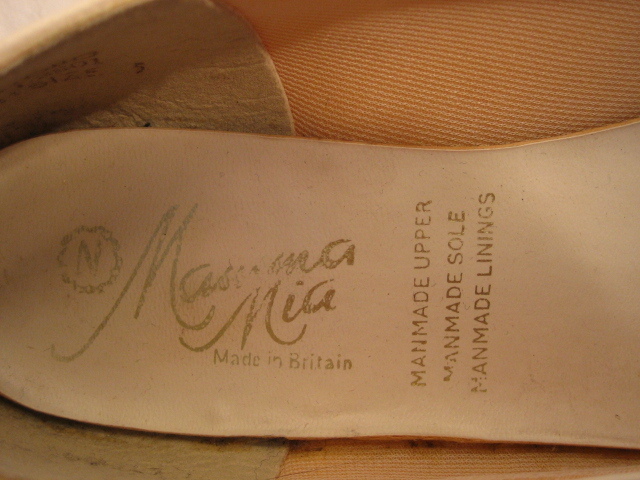 The size is given as UK 5. 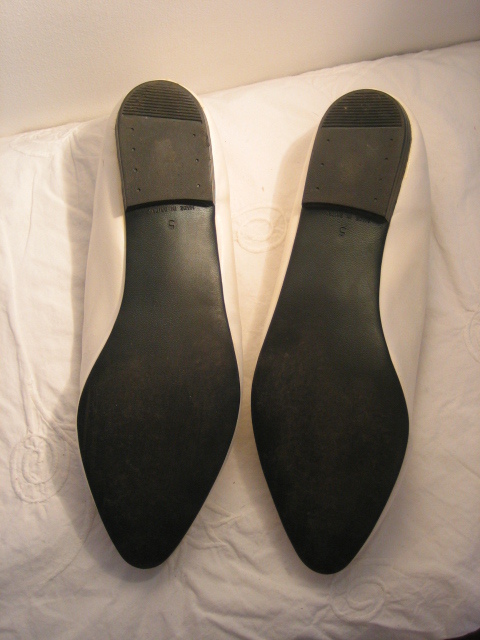 The toe is pointed, but gently; they look comfortable, smart/casual, and unworn. I can't date the style: they could be fifties pumps. There is a scratch on the side of the left shoes, and some general, slight signs of age on the fabric, probably from storage; neither of these faults are obvious. They don't fit anyone in my family, and I won't hazard a guess as to their size, but they measure approximately as follows: length (from inside) 9 3/8 inches (23.8 cms); width at widest point of sole, 3 inches (7.5 cms); heel is less than ½ inch (about 1 cm).